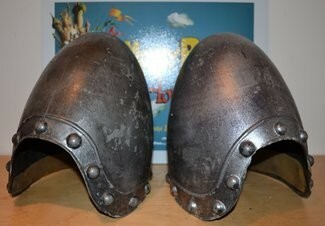 Monty Python and the Holy Grail French helmet Fibre-glass conical medieval helmet from the classic 1975 movie Monty Python and the Holy Grail. 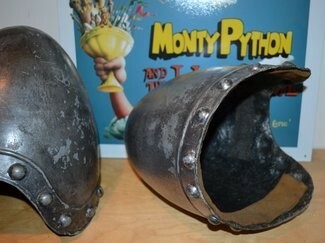 Fibre-glass conical medieval helmet from the classic 1975 movie Monty Python and the Holy Grail. We originally aquired 3 of these fantastic helmets direct from the costumiers who suplied all the costumes for this production. One has been sold and one is not for sale making this the last one to be sold. 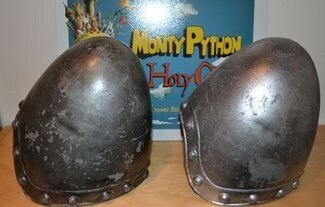 This is a gun metal grey fibre-glass conical medieval helmet from the classic 1975 movie Monty Python and the Holy Grail. Inside finished with sections of foam for support and comfort. The French taunter and castle scenes are amongst the very best ever recorded by the Python team and this classic piece will be a must have for any serious Python fan. “Go and tell your master that we have been charged by god, with a sacred quest. 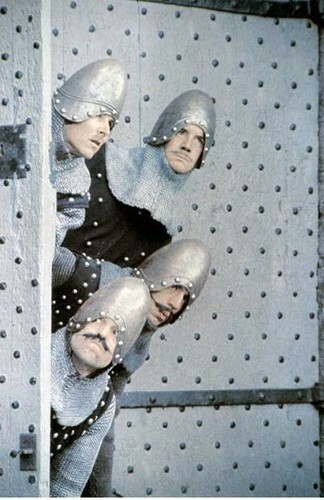 If you will give us food and shelter for the night, he can join us in our quest for the holy grail. Well, I’ll ask him but I don’t think he will be very keen, he's already got one you see! WHAT!?! He says they already got one! Well, uh, can we come up and have a look? OF COURSE not! You are English Type! I'm French! Why do you think i have this outrageous accent you silly king!